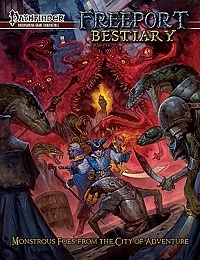 The pre-order window for the Freeport Bestiary for the Pathfinder RPG is now open! This 180-page, full-color sourcebook includes a wide variety of threats, from classic Freeport adversaries like serpentmen and fire spectres to new monsters like corsair drakes and witch beasts. It’s the perfect complement to Freeport: The City of Adventure and can be used to add spice to any Pathfinder Roleplaying Game campaign. As with all of our RPG book pre-orders, when you place your pre-order in our Green Ronin Online Store, you’ll be offered the PDF version of the book for just $5 when you check out. If you prefer to shop locally, make sure your retailer takes part in our Green Ronin Pre-Order Plus program, and they will be able to get a coupon code for you to order the PDF from us when you pre-order the physical book from them.